Ask anybody what they remember about the mitochondria, and they’ll probably say: “it’s the powerhouse of the cell.” That simple phrase has evolved from a biology class memory trick, to a meme expressing a general malaise or indifference. Because despite the necessity of these little energy-making machines, most of us still don’t know what the mitochondria are. And those of us who do remember that phrase, see it as the end of the story, rather than the beginning of one. But our mitochondria are the reason food gives us energy. They’re the reason we feel a sugar rush, and a sugar crash. They’re why we eat, drink, and ultimately how we survive. After over 40 years of research, scientists are turning to these powerhouses with one simple question: How do we keep these powerhouses full of power? Before the mitochondria became invaluable to human cells, they existed completely outside of them as bacteria. They were simple single-celled organisms, lacking even the typical membrane structure of the bacteria we know today. Until they merged with another simple cell to become a more complex unit that eventually helped build human beings and other organisms. At first the plan wasn’t just to merge. The mitochondria, as bacteria, only wanted to rob the host cells of their energy and then leave them to die. But the bacteria soon realized they were better off working together with those cells rather than against them. This process eventually led to the more complex, structured organisms known as eukaryotic cells. Today eukaryotic cells make up everything from mushrooms, apple trees, and dust mites to you. Human cells are eukaryotic which is why they have membranes, nuclei, and a bunch of other structural terms we probably learned in biology class but no longer remember. And the mitochondria’s initial energy takeover is now the very reason why we exist at all. The fact that mitochondria existed independently of the cell gave them their shape and purpose within the human body. It explains not only why the mitochondria look like bacteria, but also why they’re so uniquely vital to generating the energy we need to survive. Once they’d taken over, the mitochondria had a primary purpose: to produce energy. It sounds simple, and in some ways, it is. Even though there are several complicated processes taking place inside our cells, they all have the joint mission of creating a much-needed molecule known as ATP (adenosine triphosphate). Creating ATP is essentially a highly advanced game of microscopic hot potato. Whatever we eat or drink is broken down into pieces, and our cells toss those pieces (specifically electrons) over to oxygen molecules. Which allows the rest of the cellular respiration process to produce ATP. Research over the last few decades has shown we make less mitochondria as we age. It’s also shown that what mitochondria we do have left, aren’t very effective. Some scientists theorize this is a result of an imbalance of free radicals and our cells’ ability to get rid of them. 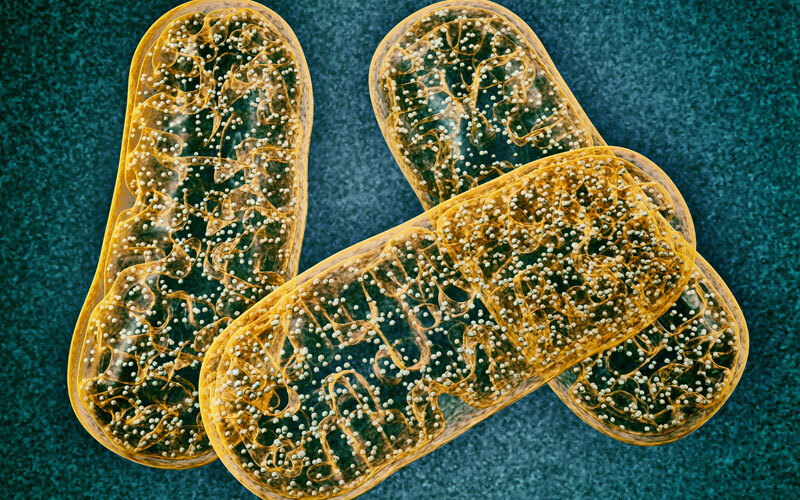 Others found evidence pointing to the leftover DNA in mitochondria as what led to their future potential for dysfunction. But most of their studies agreed on one thing: mitochondria grow less effective over time because of their decreased ability to make ATP. In some ways, you could say this makes the mitochondria somewhat human-like. They too, need a purpose. But as they age, they grow less effective at their purpose of creating energy. They become dysfunctional, diseased, and die. As a result, the less ATP we create, the less energy we have to get through the day. And we all know what “not enough energy” feels like. Although we make less mitochondria as we age, the number of mitochondria we do create is almost completely dependent on how much energy we need. The more active we are, the more energy our cells require, the more mitochondria are created to match our needs. That closely knit relationship also means that whenever we change our lifestyle or habits, our mitochondria adjust their number to that change. Some scientists have caught onto this and believe there is a connection between exercise routines and a process called mitochondrial biogenesis. They’ve found that exercise initiates a series of complex chemical reactions within the body that signal the need for more ATP and therefore more mitochondria. But the opposite is also true. A sedentary lifestyle can signal to the body that we don’t need as much ATP and inhibit the mitochondria from creating more of themselves. This reduces cellular energy, which can be felt all over the body, and is connected to more general metabolic dysfunction. Thankfully, there are a few different ways to control the number of mitochondria in our cells. They can be made from scratch (mitochondrial biogenesis), divided, donated, or selectively removed from a cell altogether. All of these methods help the mitochondria directly match their supply to our need. Ultimately, our lifestyle and habits are important indicators of how much ATP we need and therefore how many mitochondria exist to meet that need. As crucial as mitochondria are for creating energy, it’s not as simple as one organelle. A bunch of different chemical reactions are at play, with the help of various chemicals, coenzymes, and one critical molecule known as NAD (nicotinamide adenine dinucleotide). NAD is how the mitochondria turn food into energy. It’s how they make ATP, and how they play that energy-generating game of hot potato (a part of cellular respiration). Without NAD, the mitochondria could not generate energy. It’s safe to say that without NAD, the mitochondria would stop functioning, and so would we. The amount of NAD we produce declines with age, and like ATP, is heavily dependent on our lifestyle and habits. Things like working out can naturally increase NAD levels, but a bunch of other things like age, stress, staying in the sun for too long, drinking, or eating too much can all deplete NAD. Leaving our mitochondria to fight over a diminishing supply of their most powerful energy-generating resource. Scientists at universities around the world are researching the effects varying NAD levels can have on overall human health as we age. So far, the results are more than promising. We know NAD levels decline with age, and one hallmark of aging is mitochondrial dysfunction. It only makes sense researchers would want to examine the very molecule that helps keep mitochondria healthy in the first place. It’s okay if the only thing we remember from biology class is the “mitochondria are the powerhouse of the cell,” because they truly are. The mitochondria are why we evolved from single-cell organisms to the complex human beings we are today. Would we still be here today if the mitochondria had never joined forces to overtake and eventually bond with eukaryotic cells? Possibly. There’s no way to know for sure. But that’s not the point. Because they did merge. We are alive because of the mitochondria. We can read long blog posts like this one because of the mitochondria. They need us, just like we need them. Without the other, we are nothing. But together, we are the stuff of life.